Army getting in trouble throwing the ball. We throw it better than they do. What a game, and win for Army. Great call on the two point play. SDSU needed some defensive coaching from the SoCon. They would have had 10 in the box. I've said it before and I'll say it again: I'm not an expert on offensive lines but whenever I see other option teams playing (or old film of us 5+ years ago), their offensive line blocks differently than we do. I don't know why that is, like they peal out on the perimeter more directly, or something. App state Nate Woody put on a clinic vs Toledo. He is long over due for a power 5 job. Also looked at some old Nate Fuqua at Wofford and they both are night and day compared to this year's defense. The LB'S were very active and opposing OL had trouble determining were pressure was coming from. Interesting that Appie had some games in which the opposing team scored big this year. Looked unbeatable agains The Toledo Scales. Has this search gone slow because we have been waiting for Woody to finish his season? Just a thought... I don’t know the answer. App’s “bowl” win v Toledo which was one of the statistically best offenses in all of FBS football coming into it may have sealed Woody’s offer to GaTech. I doubt he is coming back. Looked a lot like how our D used to look and play. Anybody notice how many kids from App we had recruited? Moore, Pinckney, Boggs, McDaniel, Jackson, Hannon, Appling, Reed. If there is a school we recruit against more than others it’s App as much as anybody. Love their option game too. Double and triple option. Merry Christmas to everyone... Have enjoyed the correspondence the last 7 months... I hope Santa gives us a Coach by the end of next week. "I had heard Wofford spoke with former Wofford assistant Josh Conklin (now Pitt DC). Haven’t checked back on that search in a while. Will do today." Interesting. Not sure how I feel about that one. Conklin does check the box of having coached under Ayers, but it left a bad taste when he left us for the Bellhops. I would think he is making too much as DC for us to afford him though? On the positive side, he started his coaching career at S. Dakota St., so he might have some insights into how to finally beat the Bison. Might also open access to a wider recruiting footprint. Regardless, it does sound like the administration is treating this as an actual search rather than just going thru the motions only to announce someone from within. Let me lay some of the "old fogey" stuff on you guys. I don't think you can assume that money is the only, or even near the top on the list of priorities for all assistant coaches who have been through Wofford and moved on. There comes a point in each person's life when he/she has to question what truly is the highest priority. The coaching job at Wofford is unique, as is the coaching job at many of the FCS programs. It is a chance to do what you love best; be a big dog on the campus and in the community; live comfortably close to your job; have very little pressure as compared to many other coaching jobs; coach kids who are generally of good character; and live in a community that is not very costly. If a coach wants to raise his kids in a relatively small community and see them every day and night and not want to consider himself on the "move every three years" merry go round, this is a pretty good opportunity. 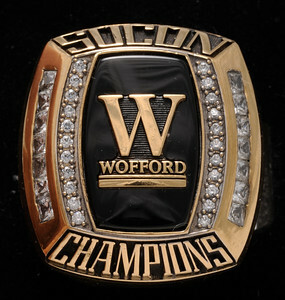 There are perks to being the head coach at any FCS school, and Wofford should work hard to provide them to our coaches. These don't need to be enumerated, but Wofford buys lots of goods and services, and those who provide them should be willing to help us out. The point is that money is not everything, and we may be surprised to find it is far down the list for some candidates. A close friend, years ago, worked for a sports related television production and programming organization. They announced they were expanding, and he said they were staggered at the applications they got from "name" athletes. He said each one would be taking a huge cut in what was perceived to be their pay, but the stability of the job was very appealing. I understand and agree with the sentiment that money is not everything... to an extent. The one proviso is whether the candidate has reached that point in his life. In looking at Conklin's history in particular, I tend to agree with YT that his track record is one of moving onto something different about every 3 years, so he may not be there yet. You also cannot blame a guy for wanting to advance his career and/or provide a better quality of life for his family. Unfortunately, our society is much more mobile and no longer seems to value loyalty like it used to, and that impacts coaching just like any other business. So, I think we are probably a bit naive if we think we will find a young guy who will be both successful and choose to stay with us for even half as long as MA did. All true, but if money is the big concern we can't compete, nor can Furman, Mercer, Samford, etc. Our appeal has to be something else. In watching Navy run the option it makes me think of what we can be next year. They don't throw it at all, but have a QB that is fast, quick and slippery.